CLEMSON, SC – When Clemson’s football schedule was released back in the spring, Dabo Swinney scanned down the slate with his eyes and paused when he came to the Tigers’ Nov. 23 date with The Citadel. Swinney’s seventh-ranked Clemson team will host the in-state FCS Bulldogs at noon Saturday, its second straight matchup against an option offense. On Nov. 14, the Tigers held Georgia Tech’s vaunted run game without a first down in the first quarter, scored the first 20 points of the game and rolled to a 55-31 win. With the regular season finale against archrival South Carolina looming next week, Swinney admitted he had initially been wary of spending two weeks preparing for the option and then transitioning back to a pro-style offense. “We actually do a little option work throughout the year, but still do good-on-good,” he said. “And when we go good-on-good, obviously we’re not running the triple option. So, the defense gets a lot of work against us – and that’s how we stay sharp. Saturday’s game with The Citadel will be Clemson’s 20th Military Appreciation Day, but it will mark the first time ever the school has held a “Purple Out” for the game. The “Purple Out” is an initiative that was generated by Clemson students and meant to represent the great significance the color purple has to the United States Military and Clemson University. “Military Appreciation Week is always a great thrill and honor for us to be able to recognize the efforts and the sacrifices that our military put forth,” Swinney said. Of course, Saturday’s game isn’t just Military Appreciation Day, but is also Senior Day for one of the most successful senior classes in the program’s history. A win Saturday would be the 37th for this year’s senior class, which would tie it for fourth place among senior classes in school history in that regard. This year’s seniors were part of Swinney’s first recruiting class, dubbed the “Dandy Dozen,” and as he noted, they took a leap of faith in joining the Clemson program at a time when it was transitioning between head coaches. 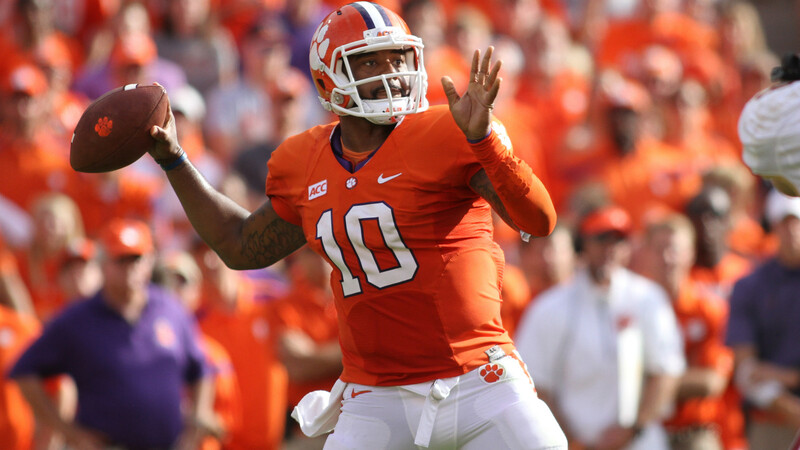 Perhaps no player is leaving more of a legacy than senior quarterback Tajh Boyd, who became the ACC’s career leader in touchdown passes with his four scoring passes against Georgia Tech and can reach 100 for his career with three more. Swinney has a picture in his office inside the WestZone of the local newspaper from Boyd’s hometown of Hampton, VA, the day after he signed with the Clemson. And Swinney said he found those words particularly fitting because of what Boyd has done for the Clemson program since he put pen to paper on his letter of intent. Boyd surpassed Rodney Williams’ school record for most career wins by a starting quarterback in ACC play with his 21st last week. If Boyd wins each of the three games remaining in his Clemson career – including a bowl game – he will pass Williams, who won 32 games under center for the Tigers, for the most overall wins by a starting quarterback in Clemson history. “It’s special,” Boyd said of playing his last game at Death Valley. “I’ve thought about it through the course of the year that time is winding down, but it really hit me yesterday. I was driving and just kind of thinking about the game last week, and I really realized (Georgia Tech) was my last night game in the Valley.